Small scale models make big impression! For most of our readers the immediate application for additive manufacturing that comes to mind is for prototyping. Producing parts that are used in development phases to prove out what will typically be a plastic injection molded part. But more recently, Synergeering has been catering to scaled model applications for demonstration or training purposes. Whether training the in’s and out on a scaled military vehicle before real life use or demonstrating the workings of very large equipment, additive manufacturing is a perfect solution to accomplish this. Synergeering recently worked with a large industrial separation machine manufacturer to scale several of their machines for these very applications. The machines full scale ranges from 18-20 feet tall to nearly 20 feet wide. 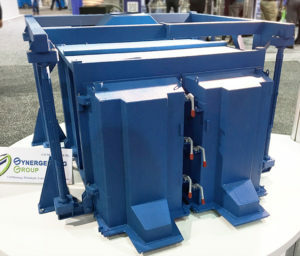 The company wanted a real life, interactive model of their equipment to be able to demonstrate their full workings so Synergeering produced a 40 scale model of these machines and brought them to life. Synergeering worked throughout the CAD to maintain these machines’ main movement features. These intricate movements included pivoting doors, working clamps, and functional rotary vibration mechanisms. When the models were complete, they were painted up to mimic the real-life models and then assembled together. These modes were recently used at a trade show and will also serve as in-house customer demonstration pieces. For more information on how Synergeering can work with you please contact us and we’ll set up a project consultation to bring your models to life the same way!